The Rolleiflex was one of the iconic cameras of the twentieth century. 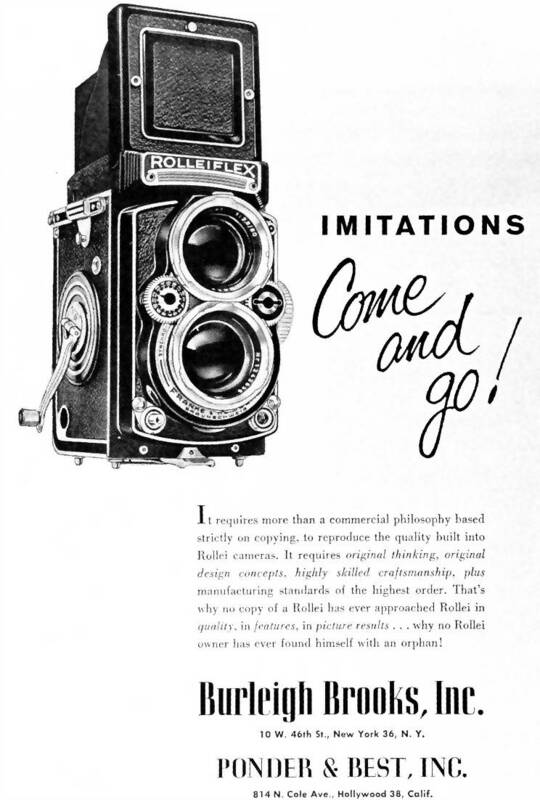 Introduced at roughly the same time as the Leica and Contax, the Rolleiflex popularised reflex photography in the same way as the other two cameras had popularised the use of 35mm film. Before the advent of the Rolleiflex, reflex cameras had been large boxes which were generally the preserve of the specialist. The Rolleiflex introduced reflex viewing to, if not the masses, certainly the committed photo enthusiast. The idea of viewing the scene to be taken on a sheet of ground glass, in the same position as the film would occupy, was pretty well as old as photography itself and may even have predated Fox Talbot’s experiments. At some stage, probably late in the nineteenth century, someone had the bright idea of constructing the camera as a box with the lens at the front, the film at the back, a ground glass screen at the top and a mirror in the middle. With the mirror at a 45 degree angle to both the lens and the ground glass, the photographer could see the image, which would appear on the film, right way up instead of upside down as in a simple camera. The viewing image would be inverted left to right, as when viewing onself in a mirror, but this was still a big improvement in speed and convenience. Reinholf Heidecke and Paul Franke looked at the reflex design and tried to work out how they could make it small, robust and reasonably cheaply. They came up with the ingenuous concept of fixing two cameras together. One was a simple camera with a high quality lens and shutter assembly. The second was a reflex camera with a cheap lens, a fixed mirror and no film chamber. The focussing of the two cameras was rigidly fixed together such that, when the top, reflex camera was focussed on a subject, so was the bottom, simple camera. The Rolleiflex was popular from the outset. Amateurs and professionals alike were enamoured of the camera’s combination of compactness, ruggedness and the 6cm x 6cm negative, nearly four times larger than the Leica or Contax 36mm x 24mm size. F&H as the company became widely known, initiated a policy of rapid development. As part of this, the Rolleiflex range expanded quickly and the original knob wound Rolleiflex aquired a new lease of life as the Rolleicord. Probably the most important innovation in the design of the Rolleiflex was the introduction of the ‘Automat’ film loading mechanism, which made film loading as easy as that of 35mm cameras and, indeed, easier than many. To understand just how big an innovation this was, one needs to consider previous roll film loading technology, which was primitive at best. The commonest technique, still in use in the Holga rollfilm camera, was to use a ‘red window’ to view markings on the roll film’s backing paper. The photographer inserted the roll of film in the feed chamber, pulled out the leader and inserted it into a slot in the take up spool, then wound the film forward until the number ‘1’ appeared in the red window. He then took the picture and wound on until ‘2’ was visible. This process was repeated until the last image had been made, after which the film was wound completely on to the take up spool and removed from the camera. Variations on this theme included semi-automatic mechanisms where the photographer wound on to frame ‘1’ as described above, after which a mechanical counter took over, stopping the winding process as each frame was brought into position. Another did away with the red window altogether, with the photographer aligning the ‘start arrows’ on the backing paper with a mark on the camera. The back could then be closed and the film wound until the mechanism locked. F&H looked at these processes and decided that there had to be a better way. Their solution was simple, elegant and, most importantly of all, reliable. They mounted a spring loaded bar behind the feed chamber, linked to the counter. In use, the new film is dropped into the camera and the ‘tongue’ of the backing paper is fed under the sensing bar, then attached to the take up spool in the ordinary way. The back is then closed and the film wound until the mechanism locks. The first picture can then be taken. From the outset, F&H positioned the Rolleiflex as a very high quality camera. The taking lens was the Zeiss Tessar, a 4-element design generally considered as state of the art in the 1930s. This design had a maximum aperture of f3.5 but the growing popularity of colour material was felt to require a larger maximum aperture. As a result, F&H introduced a design with a f2.8 Tessar. It was one of the company’s few failures and was very quickly replaced by the 5-element Zeiss Planar lens which restored the Rolleiflex’s reputation. Not long after this, F&H began a policy of dual sourcing which led to the use of Schneider Xenotars as alternatives to the Planars. Both types of lens were supplied for each model up to the 2.8F and there is no appreciable difference between the performance of the two lenses. The 2.8E2 illustrated here represents the Rolleiflex design at its peak. The main change from its predeccesor is the interchangeable hood and screen which allowed the use of the Pentaprism head. By the time of the E2’s introduction, the Rolleiflex had grown into a sophisticated system with accessories for microphotography, underwater use and aerial photography. The Rolleiflex photographer wasn’t limited to 6×6 Rollfilm, either. With appropriate accessories the Rollei cameras could handle 35mm film, glass plates or cut film. All this innovation came at a price, and quite a steep one at that. The Rolleiflex had begun life with a competitive price tag but, by the time the E2 made its appearance, owning a Rolleiflex said nearly as much about your bank balance as about your photographic discernment. In 1965, a British photographer would have to pay out one hundred and seventy six pounds, ten shillings and six pence to be seen owning the Rolleiflex 2.8F model, at a time when a very good weekly wage was twenty pounds. This put the Rolleiflex well into the luxury market for non-professionals. People who earned their living from photography, on the other hand, knew that the Rolleiflex could be relied on to bring in the money day in and day out, which made it very cheap to own, and few brides of the ‘sixties were photographed with anything else. Press photographers, too, relied on the ‘flex for its ability to synchronise with any form of flash at any shutter speed, coupled with the best weight to negative size ratio of any professional standard camera available at the time. The Rolleiflex was at the peak of photographic demand for a surprisingly long time, from roughly the end of the Second World War until the mid ‘seventies. It then came under increasing pressure from improved film materials, which made 35mm a viable competitor in a number of fields; increased expectations, which led professional users towards the Hasselblad and other medium format SLR systems and, most ironically of all, from the Japanese Mamiya C series of TLRs, which had mastered a trick that the Rolleiflex had never attempted : interchangeable lenses. Interestingly, Rolleiflexes still command high prices secondhand and there are even new ones available, not bad for a design that is more than eighty years old.